Learn what you must know to prepare for the pending release of WordPress 5.0. 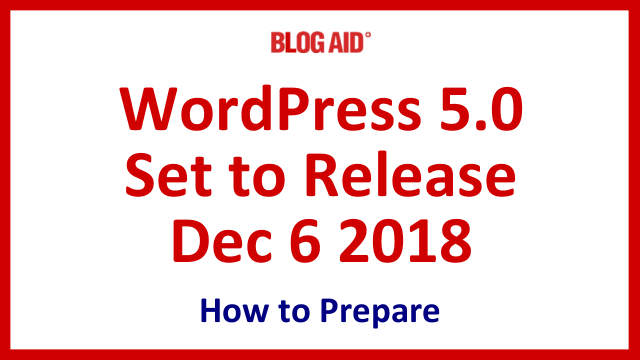 On 12/3/18, Matt Mullenweg, the co-founder of WordPress and the current lead developer, announced the new target date for the release of WordPress 5.0 will be Thursday, Dec 6, 2018. Needless to say, after missing every other projected release date since April, having only 3 days notice this time is a shock to the community. And they are not responding well, as evidenced by all the comments on the announcement. There are 2 aspects to the WordPress 5.0 release, and you need to take action on both. First, there are core updates to the WordPress code that have nothing to do with the new text editor. And, it is only being tested on PHP 7.3, which not every host is supporting, and not every site owner is on. So, there will likely be bug reports galore with PHP conflicts, as well as plugin and theme incompatibility. Second, the Gutenberg text editor will be live by default. You need to take steps to turn it off prior to WP 5.0 rolling out. I’ve updated all of my posts that prepare you for NOT updating and getting through this initial release. In that post I reference a way to turn off updates. This is a drastic measure!! But, I reported in Tips Tuesday for 12/4/18 that I’m seeing point releases (minor updates) come through even when the major update has not yet been done. So, until we get to the bottom of that, this is the only temporary fix that I know will work. However, it also keeps you from getting security updates, so use with caution, and be hyper vigilant to manually check for updates. As previously mentioned, the folks at WP have flip flopped on whether the Gutenberg text editor would be on by default and/or whether a plugin to turn it off would be bundled with the release. The final decisions have been made that Gutenberg will be the default text editor and the Classic Editor plugin will not be bundled in the release. For that reason, you need to turn off Gutenberg prior to WP 5.0 releasing. The post has all 4 ways listed at the top followed by how-tos for each way. I believe the Classic Editor plugin will be the way to go for most site owners. This is a dynamic situation and I’ll be staying right on top of it and keeping you informed. Be sure to Like, Follow, and turn on notifications for the BlogAid on Facebook so you are alerted to when I livestream breaking news. Subscribe to BlogAid News to get all of my blog posts with the site success info you need, and to keep you ahead of upcoming changes like this. MaAnna, your insights are — as usual — a breath of fresh air. Though this never surprises me, it’s always pleasant! Maybe I haven’t browsed that much, but it seems that everywhere I do, pundits are going ape over Gutenberg — how fabulous it is, how overdue, what an unmitigated blessing. I had wondered whether I was the only naysayer, and, if so, whether I was the crazy one. I understand the purpose of Gutenberg, and its advantages; I’m quite capable of using it. And yet, for my modest and simple purposes, I had already chosen to turn it off. It doesn’t seem to serve any advantageous purpose, right now, for me. And while I’m no WordPress savant, I consider myself at least marginally more “techy” than the average user. Delighted I am that Gutenberg is available. Not so delighted that its devs seem bent on herding the community into the Gutenberg compound. I think they’ll discover, to their chagrin, that this was hasty and presumptuous. Thanks for your note of sanity! I’m very excited about what Gutenberg promises to become and think it is most definitely a step in the right direction to ensure WordPress is a leader for what the internet will become. I don’t think anyone knew it would take 2 years to even get this far with it, though. No matter when it rolls out, most folks won’t be ready. But, handling the release they way they have this year is shameful.